The unseemly mess that our major political parties have made over remembering Nehru was gleefully played over our TV screens and newspapers. It did no good either to the memory of one of the finest Indians or to the values that he tried so hard to instil in us. As the nation is celebrating the 125th anniversary of our first Prime Minister Jawaharlal Nehru, let’s pause and ponder how we should pay true homage to that epoch-making soul. On nuclear weapons, Nehru proved to be both an idealist and a pragmatist. While he was dead against the bomb, he believed that when India called for a nuclear-free world, it must do so from a position of strength. When Jawaharlal Nehru died in 1964, I heard the news first over All India Radio. I ran to the barber shop where my father was having a haircut to inform him. I still remember the shock with which he received the news and the sadness that settled in. At the barber shop, as was the custom those days, pictures of leaders who fought for India’s Independence, including that of Nehru, lined the walls. Such was the reverence our political leaders were held in that they shared space with pictures of gods in shops and at home. In contrast to Gandhi and Nehru, today’s pretenders to that legacy have betrayed the core values of the personalities whose names they want to permanently own. The unseemly mess that our major political parties have made over remembering Nehru was gleefully played over our TV screens and newspapers. It did no good either to the memory of one of the finest Indians or to the values that he tried so hard to instil in us. Nehru may be a historical figure to the young and restless of this nation but to those of us who grew up in the 50s and 60s, he was our hero. We hung on to his every word, went to his public meetings and read whatever he wrote. Old or young, Hindu or Muslim, man or woman—there was no Indian whose life he did not touch in a special way. I was 13 years old when he died and can recall clearly where I was and what I was doing when news of his death was announced on the radio. It was as if one of my own family had left us forever. As schoolchildren, we learnt his last will and testament by heart and it stays with me to this day. To me, and so many of my generation, that will always remain his legacy. ‘Here was a man who with all his heart and soul loved India…’. I was transported to this era as I watched a special TV programme, anchored by Ravish Kumar, on NDTV’s Hindi channel. Shot in Teen Murti Bhawan, the official residence of the Prime Minister in Nehru’s time, it tried to look for Nehru by recalling his life and times that lie in the rooms and corridors of this grand residence now preserved as the Nehru Memorial. I have not been to the memorial for almost 30 years and it transported me to a time when India was a very different country. So let me tell you what was different then: our political leaders did not live in fortified castles, nor did they move inside a tight circle of security men, who do not allow anyone to come near—let alone touch—their charges. On the other hand, Nehru often broke cordons erected between him and the crowds to shake hands, hug and even dance with the people of India. When he addressed a public gathering, there was such palpable sincerity in his words that each Indian felt as if he was speaking to him or her alone. As soon as news of Panditji’s imminent arrival reached a town, the whole population would converge to the ‘maidan’. Nehru came in an open vehicle to be greeted with a roar from the crowd, nimbly ran up the steps to the podium and held his audience spellbound. Fresh as the rose he wore in his buttonhole, he seemed to derive such energy from the immense love and affection that flowed from his listeners that his patrician face became incandescent. Yet, while he seemed at such ease with crowds and loved to be among his people, no one is unaware of the essential solitude of the man. Years ago, on a schoolgirl visit to Anand Bhawan in Allahabad, I remember standing in the room he used to occupy in his parental home and being struck by its lonely air. All that Nehru’s bedroom had was a single bed, neatly covered with a handloom bedcover, a bedside table with an alarm clock, a copy of the Gita and a framed photograph of his wife. The same austerity hangs over his room in Teen Murti, where he breathed his last. There are shelves of books along the walls, but the bed and bedside tables are exactly the same as that spartan room in Anand Bhawan. There is also a table fan, its rusty blades a testimony to a time when our political masters did not function out of air-conditioned spaces. In every sense, they breathed the same air as the rest of the country and that is perhaps a reason why they never lost touch with the common man. Granted that those were simpler times and that many conveniences of modern life that we now consider essential were not available, let us not forget that several Indians who joined politics then were prepared to give up lives of ease and comfort for a cause larger than themselves. They did not come into politics to seek a life of comfort and ease. In stark contrast to the original Gandhi and Nehru, today’s pretenders to that legacy have betrayed the core values of the personalities whose names they want to permanently own. When was the last time that any one of them stepped out of their comfort zones to touch, hug or dance spontaneously? Have they ever even seen a table fan with rusty blades, let alone slept in a room cooled by its noisy whirr? So before they stake claim to the legacy of Nehru, let the Congress remember that many of them hardly know the essential Nehru or care to emulate the original Congress Party. They did not ever experience the thrill of pride that each one of us did as we cheered him when he came to visit our school or weep when he died. Crocodile tears at that lost legacy do not count. Nehru was ours: no party or clan alone can appropriate his memory. Modi’s speech in Mumbai, comparing genetics and stem cell research to Karna’s birth is indicative of the appeasement by political and social powers that has crippled our nation through centuries. Almost half a century over these historic exhortations by the nation's visionary leader, truth is that this "rich country" is still inhabited, if not by "starving people", by people shackled by the bands of “superstitions, miracle mongering and obscurantism”, especially in the living core of this great subcontinent spread over more than 7,00,000 villages and habitats. Unless these shackles are broken, Nehru's vision of progress through making friendship with science will still remain a toy for the elite and an exploiting tool for a few. I was elated after listening to this speech. As an Arya Samaj activist, I have crusaded against these very social plagues in spite of criticism and murderous assaults. Sometimes, the greatest service to society is to call a spade a spade. Modi’s speech could truly be the instrument of change to destroy these oppressive structures of religious bigotry. This in true sense would have been a fitting tribute to Nehruji. But while Nehruji always remained committed to his resolve of crusading against blind faith, our current Prime Minister has dented the very ideals his own speech had espoused through his actions—be it his constant visitations of religious sites or his frivolous and wasteful “rudrabhishek” in Nepal. His recent speech in Mumbai, where he compared path-breaking genetics and stem cell research to Karna’s birth and plastic surgery to Lord Ganesha, was shocking. For a gathering of overzealous “svayamsevaks” this might be an inspiring speech, but coming from the Prime Minister of a nation, that too while inaugurating a state-of-the-art hospital, this is indicative of the very sickness of blind faith and its appeasement by the political and social powers that has crippled our nation through centuries. This kind of nonsensical comparison of the developments in modern science to mythology is extremely unbecoming of a Prime Minister of a country that is still deeply ridden in blind faith and obscurantism and needs an enormous movement for the inculcation of rationality and scientific temper. This kind of irresponsible and laughable trivialisation of modern science will not only negatively affect our scientific research and fraternity, but also damage our rich metaphoric mythology by turning it into non-serious stories like Ganesha and his elephant head or others that have metaphoric values and should not be taken literally. Swami Dayanand in his magnum opus “Satyarth Prakash” has explained several such references and elucidated the metaphorical philosophy behind them. I advise the Prime Minister to read and follow such rich and enlightening literature instead of only Dinanath Batra ji’s books. 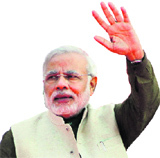 His speech in Mumbai would not only ravage his personal reputation, but also hint at the intellectual bankruptcy of the PMO. As our Prime Minister, he is duty bound to uphold Article 51(a) of the Constitution in letter and spirit, which enjoins upon each one of us “to develop the scientific temper, humanism and the spirit of inquiry and reform”. And speeches like these not only contradict this talisman by the Constitution, but also his own vision of a modern India, with bullet trains and digital networks, 3G villages, etc.